I've got lots of Easter projects to share and to start with is a SUPER simple way to create pretty eggs. Forget about color and keep things simple with black and white doodles! I started by poking a hole and blowing out the yolk. and then I went to town with my favorite supply ever- a black sharpie! 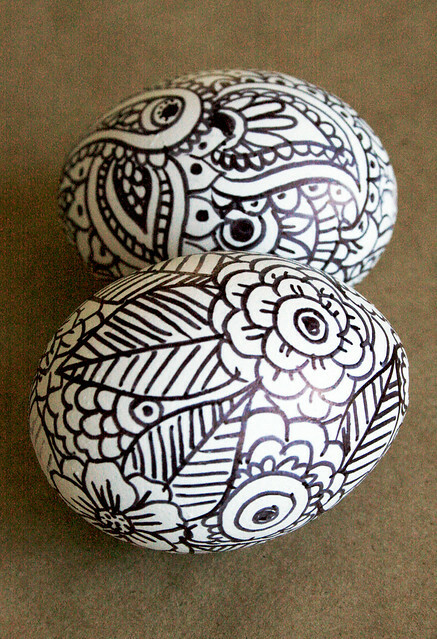 I doodled my way across the surface of the eggs with flowers, paisleys and all kinds of simple designs. The outcome is a very simple and pretty Easter egg. The simplest ideas are always the best, thank you for sharing this. Wow!!! 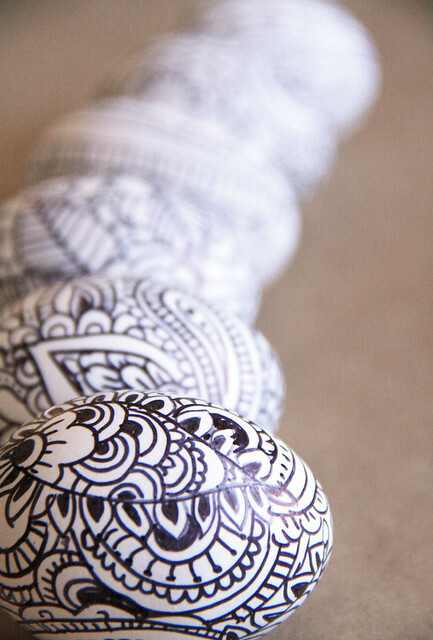 Amazing what you can do with a Sharpie... those look beautiful!!!! I like those. They remind me of Henna Tattoo's. Very pretty. absolutely gorgeous! I love when I Look at your stuff, I know they are yours. You have such a style about you. A very Alisa Burke Easter. I love these. I was laying in bed thinking of something simple I could make to take to my sister's at Easter. 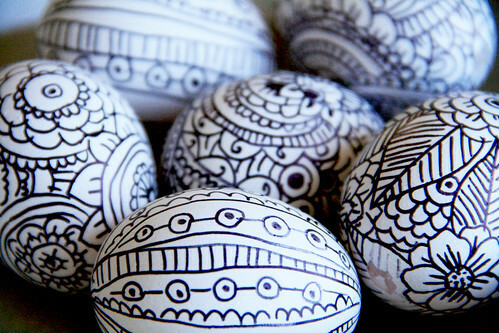 I may do them with color on the egg first and then the black. Pretty, eggs for tea then! A great idea! Thank you!! That is so awesome. That I would do!! Thanks. I love this idea, but blowing out the yolks is sooo hard! Still lovely to look at! I'm so glad you shared this idea. I was cleaning out my work areas the other day and found 3 eggs whose yolks I blew out YEARS ago (I can't believe how long they have survived in this box), and I didn't know what to do with them. Now I know!! Fabulous and yet so simple! The eggs are very cute, what a wonderful idea! very beautiful. I like this kind af drawing very much myself! my favorit are spirals! Love the doodles! Thanks for sharing. You just made Easter eggs cool! These eggs, as with all you do, are all just fabulous. I have scheduled a mini feature over at Extreme Personal Measuresfor this afternoon. I am in awe! I just shared your link on my blogs FB page. Hi. Love your eggs. I'm posting a link to you on my blog today. These are beautiful. Wow - thanks for sharing! 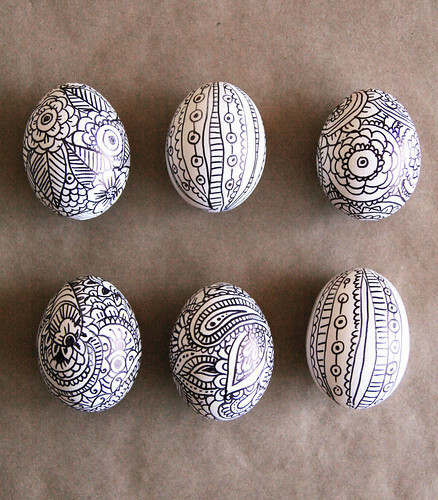 Loved this and the watercolor egg tutorial so much I HAD to feature them on my site. Absolutely beautiful work! WOW! You are so talented! Thanks for sharing! Those are so ingenious. 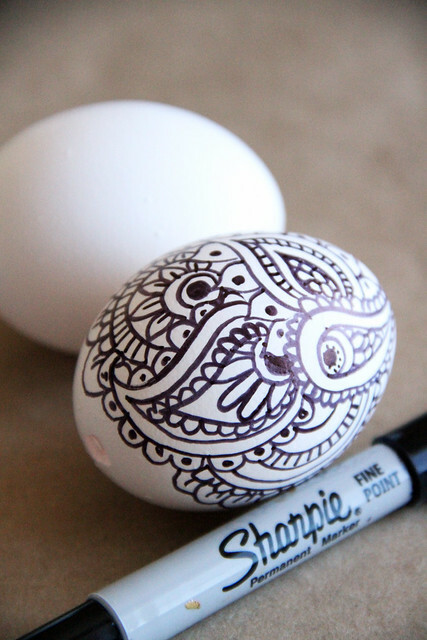 I did something similar with a sharpie on a dollar store plate at Christmas, but never thought to do it on Easter eggs. I will have to give it a try. These are lovely. So artistic. Great job! I love everything you do. These are Simply Stunning! Thank you for sharing your creativity. Can you use the Sharpie (safely!) on regular boiled eggs that can be eaten later? 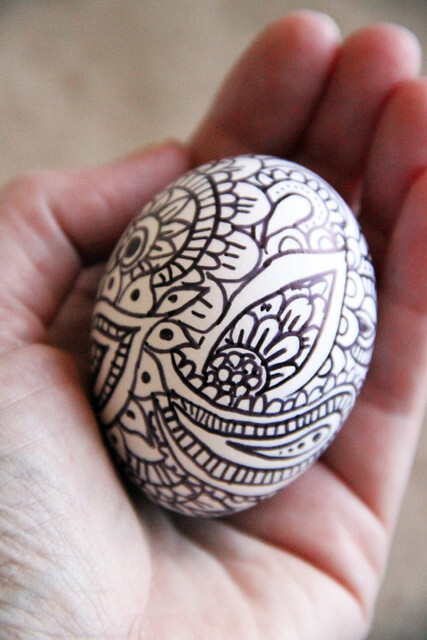 You are a woman after my own heart--doodling on eggs! I love the watercolor ones too. How inspired! Hi Alisa! I'm so excited today... it was many many years the I didn't draw anything anymore! Your eggs inspired me and I tried again! Thanks a lot and good luck for the new changings and your future! You say to blow out the yolk. 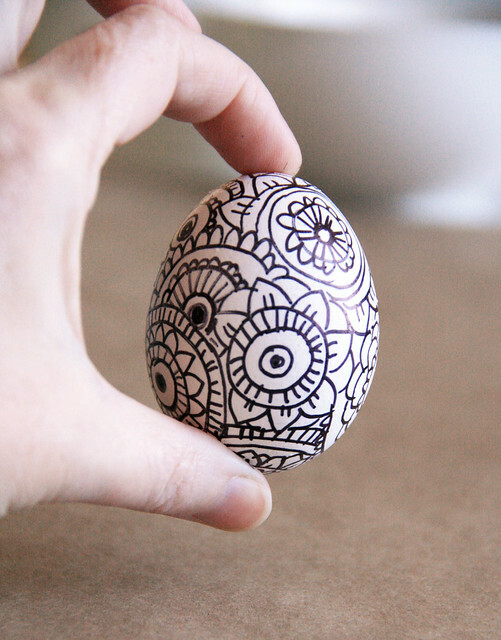 Would there be any reason you couldn't do this with a hard-boiled egg? These are just so gorgeous and creative! I love them and may try some tonight! Thanks. It will be a relief that all I need is my trusty Sharpie after what we went through Sunday trying our hands at Star Wars Easter Eggs. I would want to put a fine iridescent glitter on them or maybe some chunky on some too. if you are looking for a quick and easy way to punch a hole in the shell, use a dremel tool with a small grinder attachment. Makes perfect round holes. 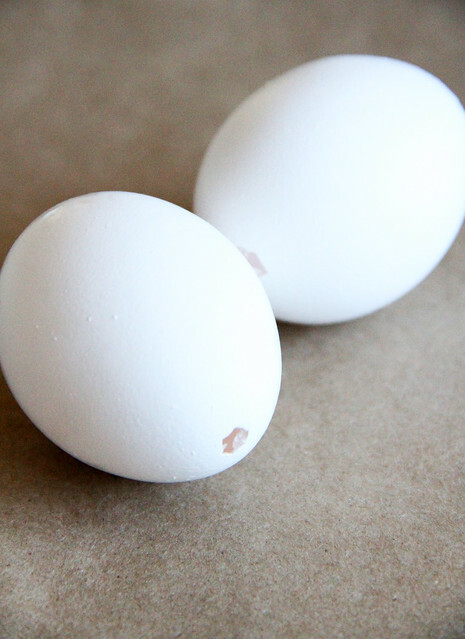 Put one hole at the fat end of the egg and one at the narrow end of the egg. Use an aspirator to push the contents out of egg. Cool! Looks beautiful. 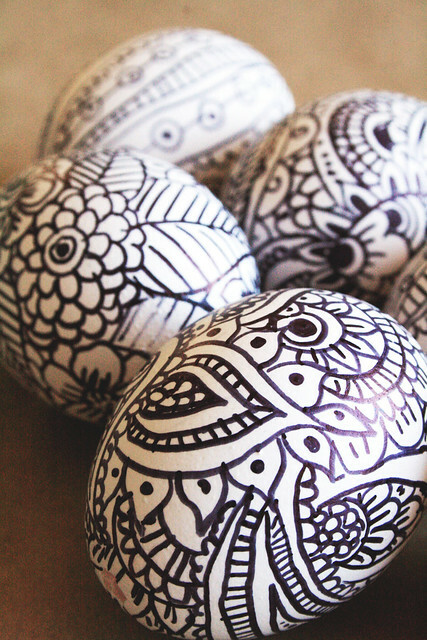 I've done the "doodle" easter eggs too, two years ago. Last year it was marker airbrush patterns. I don't know what will I do this year (I try to do a different way of decorating very Easter), maybe your blog will give me some idea :) The watercolor ones look great too, so maybe?